Traditionally, hills have not been my forte - but since training in Providence and zig-zagging my way up and down the hills of the East Side every day, I've come to realize that maybe hills aren't so bad. Sure, I still get dropped by my training partners on hard hills, but the gap isn't as big as it used to be... so going into these spring road races, I tried to convince myself that I wouldn't succumb to the monster hill climb on the big bridges. 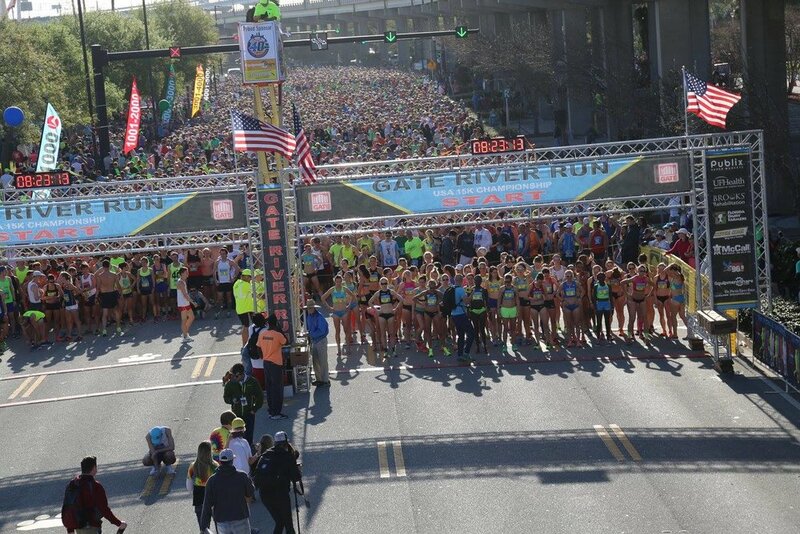 Gate River Run was a fantastic way to kick off 2017 -- I always love going down to Florida for some sun and Vitamin D as the New England winter rages on. This race serves as the USA 15k Road Championship and the elite athlete coordinator, Richard Fannin, pulled out all the stops to bring in arguably the strongest women's field in recent years. I was feeling pretty anxious the morning of the race, but I tried to take comfort in the fact that training in February and March had gone great. The race started out slowly, no one wanting to lead for the first 800 meters. A pack started to solidify after the first mile, and I stuck myself in it with the top 10 women. As we approached 5k, someone threw in a surge (we split 5:11 here) and I knew that was a bit hot for me, so I backed off to 5:25s, letting the leaders go. But I kept my eyes ahead and kept grinding through the neighborhoods, and slowly people started coming back to me. As we reached the base of the bridge, I was in a pack with Elvin Kibet and Liz Costello and we began the windy ascent together. The men, who started 6 1/2 minutes behind us as part of the race equalizer, caught us on the hill, and I tried to gain some momentum from them as they sped by. It was a long climb, almost a mile uphill, but once you reach the top, you have a sweet downhill mile to the finish. I had felt so strong throughout the race, so smooth -- until about the last 500 meters. As I came off the bridge onramp onto the final straightaway, I was praying I could hold on for just a few more meters. Thankfully, I'd timed things just right, using up those final ounces of energy right before reaching the finish line. I was exhausted, but so happy (evidenced by a little fist pump as I crossed the line!). 7th place and a new 15k PR, it was a super day! Post-race, I celebrated with running friends by lounging by the pool (reading some papers for grad school, as school doesn't stop for road races...), taking a boat tour of Jacksonville, and then enjoying ice cream and wine at the post-race party. Then it was back to Providence on Sunday -- back to school and back to training! Earlier this year when I was invited to race in Charleston at the Cooper River Bridge Run, I jumped at the opportunity, as I'd never been in South Carolina before and was eager to check off a race here in my effort to run a race in all 50 states (I still have many to go!). The race fell during my spring break from grad school, so Avi and I made a little vacation out of it. I was thoroughly impressed with Charleston's Southern charm -- the city and its surrounding beach towns, the amazing food, the people's warmth and welcoming attitude -- it was wonderful! I loved exploring Charleston on foot during my runs - I ran all around Folly Island, getting in some joyful beach miles, and discovered a lovely park near our hotel in Mt. Pleasant, with pretty dirt trails surrounded by moss-filled trees. We lucked out with the weather on race day -- it had been quite windy and a bit rainy on previous days, but it race morning brought nice temps and only a bit of breeze. I warmed up with Becky Wade, a super sweet fellow competitor, speedy marathoner, and talented writer (if you haven't read her book Run the World, I highly recommend it!). A few drills, strides, and bathroom spots later and it was race time! Becky, Katie Matthews of the BAA, and I all worked together for the first few miles, running strategically as we approached the big bridge. The winds on the bridge were fierce, so we tucked in single-file behind a tall guy (thank you, Tall Runner Dude, for breaking the wind!). Unfortunately, the wind took its toll on our tall guy, so as we approached the halfway mark I made a move. I had to battle the wind solo for a bit, but it paid off as I caught a Kenyan woman who'd gone out faster than me. We worked together for the remainder of the race, battling side by side til the last 300 meters, when I was able to pull away. I finished in 6th overall and as the top American -- overall, a fun and successful day! Post-race, Avi and I explored Charleston - and by explored, I mean we ate our way across town (sense a theme here?? My post-race celebrations always involve food!). From fried chicken & waffles to shrimp & grits, we did not leave Charleston hungry. It was a truly beautiful, historic, romantic city, and I'd love to return someday. Speaking of exciting, I have a pretty awesome announcement that I can't wait to share with you next week - stay tuned for a post with the big news!! Til then, run some joyful miles and happy spring! Newer PostJoining the rabbit team!